Mini's crossover entry, the Countryman, is all-new for 2017. The new model is 3 inches longer in wheelbase and 8 inches longer overall adding to interior legroom. Countryman is offered with 3- and 4-cylinder engines, manual and automatic transmissions. All-wheel-drive is optional.
. MINI USA introduced today the biggest, most adventurous MINI ever, the all-new 2017 MINI Countryman.� That's not all. For the first time ever, a MINI model will be offered as a plug-in hybrid, combining the best of both worlds.� The MINI Cooper S E Countryman ALL4 will be powered by both a three-cylinder MINI TwinPower Turbo Technology gasoline engine and an electric hybrid synchronous motor. 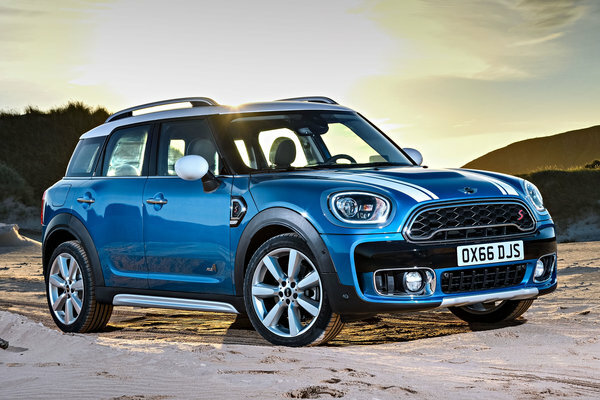 �All three of the new MINI Countryman variants will make...Read.